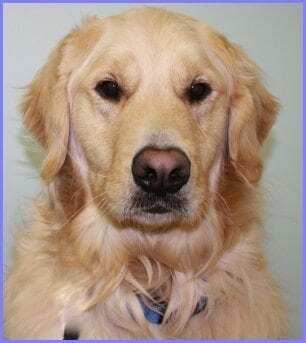 Brody #5141 - Yankee Golden Retriever Rescue, Inc.
Brody was 2 ½ years old when his family surrendered him to YGRR. Brody was very much a part of his family, but he had been diagnosed with a genetic knee condition. His owners took him for an orthopedic consult and learned that Brody would require surgery on both knees. With a young family to support, Brody’s owners could not take on this unexpected expense. They wanted him to have the care he needed, so they made the decision to bring him to YGRR. Our vet confirmed Brody’s diagnosis and we scheduled him to see our orthopedic specialist. Brody had luxating patellas in both knees. This condition causes the kneecap to slide out of place, causing pain and lameness. The stress this put on Brody’s back legs also caused him to rupture his cruciate ligaments. Brody was scheduled to have surgery on his most painful side first. He then came back to Riverview to recuperate. 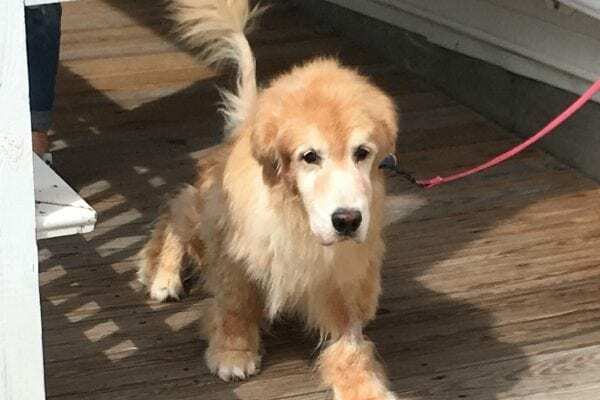 Luxating patellas are more complicated to fix in large breed dogs like Goldens, and Brody suffered some post-op complications that required him to see the orthopedic specialist several more times for the same knee. After many months of recuperation, Brody was finally scheduled to have his second knee done. Thankfully, this surgery and recovery went smoothly. Brody was put on a regimen to build up his strength and muscle mass after such a long period of relative inactivity. He was a young Golden, so it could be a challenge to keep him from overdoing it. When he was being walked, staff had to be constantly vigilant for stray tennis balls – if Brody saw one, he would want to pounce on it! He was a very sweet and playful boy, and it was very rewarding to see him able to enjoy more and more of the activities that young Goldens adore. After his extensive stay, we wanted Brody to have only the best home. Brody is now happily living with a repeat adopter who is committed to ensuring that he stays on the correct path to a full recovery. Brody is settling in to his new home and routine very well. He is enjoying being more active, and although he has puppy-like spurts of energy, he is able to settle down nicely. His adopter does have to be alert to his counter-surfing and towel stealing habits, however – Brody keeps her on her toes! Brody is well on his way to enjoying all his favorite activities with gusto. He is feeling good and is a very happy, enthusiastic Golden boy. It is hard to tell who is happier, Brody or his new family. His adopter is thrilled to be greeted everyday once again by a wriggly, spinning ball of Golden fur!